Buy Online Now! 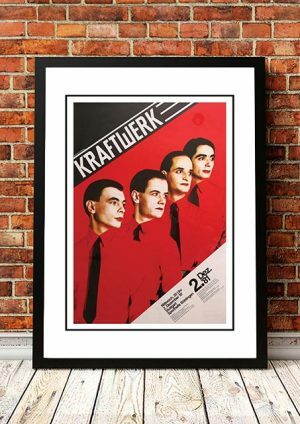 Classic Kraftwerk Concert Posters and Memorabilia. Kraftwerk’s robotic, repetitive, all-electronic music influenced virtually every synthesizer band that followed in its wake. In the mid-’70s the German group literally invented the man-machine sound and image. In 1970 Ralf Hütter and Florian Schneider-Esleben, who had met studying classical music at the Dusseldorf Conservatory, founded Kling-Klang Studio. Their first recorded appearance together is on 1970’s Tone Float, the debut by a psychedelic kraut-rock quintet called Organisation. After leaving that group, Hütter and Schneider took the name Kraftwerk (“power plant”) and began experimenting with integrating mechanized sounds from everyday life into music. They found immediate success with their first U.S. release, Autobahn, which went Top 5. The requisite hit was an edited version of the 22-minute minimalist title track about a monotonous journey along the famed German–Austrian superhighway. We stock an awesome Kraftwerk Print from their ‘Man Machine’ Tour in 1981.